In 1725, the existence of a parish workhouse in Ampthill is mentioned in the SPCK's An Account of Several Work-houses.... A workhouse also operated at Shittlington (Shillington) from around 1724 (Emmison, 1933). A Parliamentary Report of 1777 listed parish workhouses at: Ampthill (up to 25 inmates), Clophill (20), Cranfield (24), Flitton (11), Hawnes [Haynes] (12), Houghton Conquest (20), Maulden (30), Shittlington [Shillington] (40), Silso (22), and Stepengley [Steppingley] (20). In 1790, Shillington's workhouse was in a sorry state, with the inmates' clothing and linen in a wretched condition. Nine of the house's twelve beds having only a single pair of sheets, so that when these were being washed, inmates had to do without (Page, 1908). The residents included three infants but no cradle was provided. The establishment was run by a contractor who also ran an ale-house located half a mile away, where the inmates' food was prepared before being delivered to them. The absence of a resident master resulted in idleness and misconduct in the workhouse. In 1801, even worse situation existed at the Haynes and Houghton Conquest workhouses where the buildings were barely fit for human habitation and a "cruel and oppressive" regime existed. A similar picture was reported at Maulden in the same year. In 1807, Lidlington workhouse, formerly the parish pest-house, was was described as "not fit for the habitation of men, ruinous, dilapidated, and decayed" while "the poor therein are in want of food, clothing, bedding, fire, and every other necessary accommodation." The 21 inmates were "in the most wretched condition, without any governor or master, or without any care or attention from a parish officer." Five people were sleeping in a bed which consisted of little more than rags. Another slept on the ground with a few rags for cover. In 1811, a new House of Industry was erected at Ampthill on Park Hill. The parish of Hawnes (or Haynes) had a workhouse at Deadman's Cross — the building is now used as a pub and restaurant. 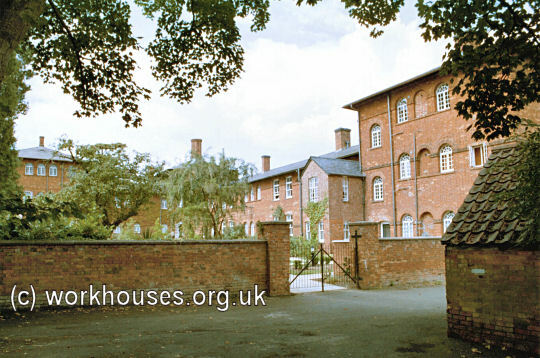 Hawnes former parish workhouse, 2005. The Assistant Poor Law Commissioner assigned to Bedfordshire, Daniel Adey, had originally wanted to create a large union of 101 parishes centred on Bedford, and making use of Bedford's existing large and efficient workhouse. However, there was strong resistance from local estate owners who much preferred smaller unions where they exert more influence. As a result, four smaller unions were created at Bedford, Ampthill, Biggleswade, and Leighton Buzzard. Bedfordshire: Ampthill (3), Clophill, Cranfield (2), Flitton, Flitwick, Hawnes [or Haynes], Higham Gobion, Houghton Conquest, Lidlington, Lower Gravenhurst, Marston Moretaine (2), Maulden (2), Millbrook, Pulloxhill, Shitlington & Lower Stondon, Silsoe, Steppingley, Upper Gravenhurst, Westoning. Later Additions (all from 1899): Aspley Guise, Aspley Heath, Battlesden, Eversholt, Harlington, Holcot, Husborne Crawley, Milton Bryan, Potsgrove, Ridgmont, Salford, Tingrith, Toddington, Woburn. The population falling within the union at the 1831 census had been 14,357 with parishes ranging in size from Lower Gravenhurst (population 77) to Ampthill itself (1,688). The average annual poor-rate expenditure for the period 1831-34 had been £14,602. In May 1835, the Ampthill area was the scene of serious anti-Poor law demonstrations. The disturbances were triggered by resentment at the forthcoming replacement of cash out-relief by a system of payment in kind. Those accused of being the ringleaders of the uprising were arrested and committed for trial. The proceedings featured in a Times report on May 19th, a shortened version of which is reproduced below. SERIOUS RIOTS IN BEDFORDSHIRE.—THE NEW PO0R LAW BILL. The Relieving Officer of the Western Division of the Ampthill Union entered on his duties for the first time on Monday last, when he rode over to Ledlington (sic)to arrange with the overseer respecting the paupers, and on his arrival there received the treatment as detailed in the evidence below. On the Tuesday following he proceeded on his duties to Milbrook, where he met with a similar reception, and was so grossly assaulted by the mob that he was compelled to seek shelter in the house of the Rev. G. Cardale, a county magistrate, who addressed the mob, and requested them to disperse quietly. Mr. Cardale and his son then accompanied the relieving officer, Mr. Osborn, down the village, when the mob continued their threats and vociferations so violently that the three gentlemen were again obliged to take shelter in a house. The paupers had now collected in such numbers, and their threats were so outrageous, that Mr. Osborn would not venture to make his appearance again that day, but remained concealed until night, when he went home by stealth. Thursday was the usual day for the meeting of the Guardians, and accordingly they assembled at the Ampthill House of Industry, at the usual hour, 12 o'clock. They had not been long in deliberation, when the paupers, men, women, and children came flocking in from all quarters in great numbers, many of the men armed with bludgeons, sticks, &c. Several of the men told the Guardians that they wanted work, and to be paid for it in money, but that they would not take relief in bread. They were told that their demand for money could not be complied with, when they commenced a most desperate attack upon the windows with stones, brick-bats, cabbage-stalks, and every missile that could be found. Many of the Guardians attempted to address the mob (between 300 and 500 persons), but could not obtain a hearing. Stones continued to shower against the windows, and in the room where the Guardians were assembled several gentlemen were severely hurt, and one in particular, whose eyes were much cut with broken glass. At 25 minutes past 1 o'clock H.M. Musgrave, Esq., a magistrate, and president of the Board of Guardians, advanced into the mob, and in two places read the Riot Act. This had only a partial effect, for on the Guardians proceeding from the House of Industry to the King's Arms inn, they were followed by a large concourse of people, shouting and threatening all the way. Opposite the inn, in the middle of the market-place, a regular fight took place between the special constables and the mob; as often as any of the former took prisoners into custody they were rescued by the latter. The magistrates and Guardians now deeming the local Authorities insufficient to overpower such numbers as had then collected, D. G. Adey, Esq., went off express for London to request assistance from Government, and Mr. Graeme, the auditor to the Union, was also despatched at 5 a.m. on Thursday for a body of the metropolitan police, who arrived, 22 in number on Friday morning. They were shortly afterwards despatched, accompanied by H.M. Musgrave, Esq., and a number of special constables on horseback, in search of the ringleaders. Mary Walker, Amelia Gulliver, Hannah Reed, and Elizabeth Henman were charged with riotously and tumultuously assembling, &c., at Ledlington, on Monday last, the 11th instant. Mr. J. Osborn deposed that he is relieving officer to the Western Division of the Ampthill Union. Went on Monday last to Ledlington, to an appointment with the overseer, and on arriving at his house, found the prisoners at the bar at the gate. They said, "We don't want you here, and we'll have money or blood, and before you leave this we'll have either the money out of your pocket, or the blood out of your veins." Witness remonstrated, and told them he had no orders to relieve them. They still cried out, "Money or blood." He then went into another room. One of the women said she knew witness had got money ; and while he was surrounded, she put her band into his pocket and took out 4l. odd. A lad called out, " If he don't give us a shilling each, we'll have his blood before we go." Witness gave all the money he had, from fear only. In defence, the women said they cried out "We'll have money, or lose our blood." One or two remonstrated on the hardship of being obliged to leave their families. The four prisoners were fully committed for trial for the riot. John Taylor, Henry Reed, and James Waters, were charged with riotously and tumultuously assembling at Ampthill on the day previous (Thursday, May 14 ), with force of arms, &c.; Rufus Sharp deposed, that he is governor of the House of Industry at Ampthill. On the day the Guardians met saw about 150 labourers come in a body to the House of Industry. One man in a red waistcoat gave the word "halt". Witness asked his name, and tried to shut the gate. H. Reed (the prisoner) then tried to rush at the gate, and called out to the other men, "Come on; don't mind him." Witness collared some of them, and tried to shut the gate; it was, however, forced open, and he then tried to get to the house as quick as he could. The prisoners collared witness. A great riot then took place. Stones and pebbles were thrown at the windows, 142 panes of which were smashed. A large band-basket of stones was afterwards picked up in the house. Richard Abbes was on duty on the day in question. Saw a mob of 200 persons. Heard Guardians address the mob, who cried out, "Blood or money; no bread." Heard windows rattling. The prisoner Reed struck witness with a large stick, when he said, "Reed, you rascal, don't strike me." Saw Taylor trying to get witness away, and be rushed forward. Heard the Riot Act read by H. Musgrave Esq., twice. Reed, in defence, denied the assault, and said he could have struck witness if he had a mind, as he had a stick in his hand. Mr. R. M. Morris stated that he particularly noticed the prisoners as ringleaders of the mob. Stood near Mr. May when he tried to reason with the mob. Went to the door of the House of Industry, as he considered the invalid paupers to be in danger. Mob rushed at witness, and the prisoner Taylor brandished a stick at him. The Duke of Bedford's steward came up, and received a blow at that time. Witness saw Waters put his fist in the fate of Mr J. Morris. Robert Savage, constable of Ampthill, saw between 200 and 300 people. Heard them cry, " Blood and Bread, or Work and Money." Saw the prisoner Waters strike J. Morris, Esq., with his right hand. Saw Reed there toe. He appeared forward in the business, and cried out " Pull him out." Witness considered the Guardians in danger of their lives. H. M. Musgrave, Esq., sworn.—I am a magistrate, a member of the Board of Guardians. Saw riot, and after My brother guardians had tried to address the mob, I did so and partly obtained silence. Reed said, " Oh, you d——d villain, we won't hear "Bread, Some called out "silence." Reed called out " Bread, bread, and down with 'em." When the windows had been demolished, witness came out of the house, and saw the prisoner Reed rushing at Mr. Morris, who defended himself with an umbrella. Witness then fetched the Riot Act, and said, "Reed, you're the man who pointed me out." Thought Mr. Morris must have fallen a sacrifice to the fury of the mob. Witness seized stick, but did not use it. Found that reading the Riot Act produced an effect on the mob. Saw Reed time after time, and considered him the ringleader of the mob. John Burgoyne and William Letting were next charged with the capital offence of continuing to create a riot beyond the hour after the Riot Act had been read, notice of which bad been posted in conspicuous parts of the town. Richard Abbess, constable, deposed to the same facts as proved against the other prisoners, except that they continued their riotous behaviour beyond the time specified. Both prisoners were fully committed on the capital charge. It appears that Government promised Mr. Adey that the Household Troops from Windsor, with as many more might be requisite, should be sent down on the shortest notice, whenever the magistrates might deem their presence necessary. 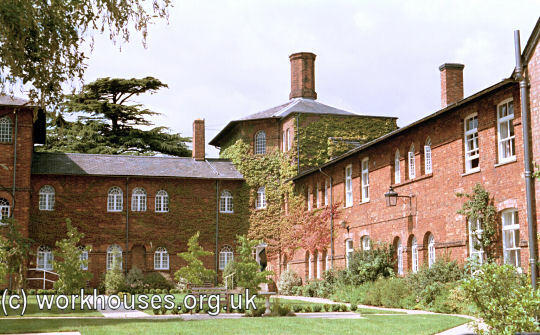 A new Ampthill Union workhouse was built in 1835-6 at a site on the eastern side of Dunstable Street. It was somewhat larger than average and was built to accommodate 400 people for which the Poor Law Commissioners authorized an expenditure of £6,400. The architect was James Clephan whose design employed an elongated version of the popular cruciform or "square" design. This was an unusual feature in workhouses of this period and is also found in Clephan's only other workhouses at Wellingborough and Saffron Waldon. The workhouse location and layout can be seen on the 1924 map below, by which time the workhouse had become officially known as Ampthill Poor Law Institution. 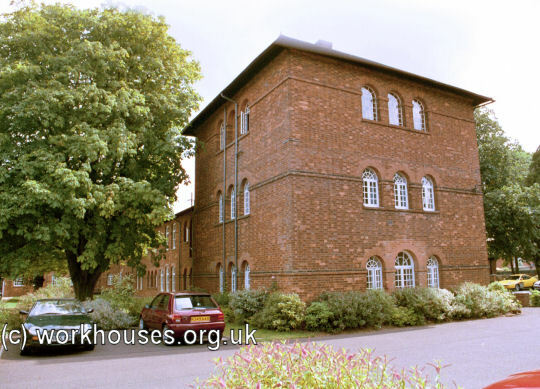 The workhouse was built in red brick, with the accommodation ranges radiating from an octagonal hub. The hub had the usual observational windows from which the workhouse yards could be observed. The ranges themselves were two-storey, terminating in large three-storey blocks. Ampthill general view from the south-east, 2000. In 1899, the Ampthill Union was enlarged by the addition of a number of parishes from the adjacent Woburn union which had been dissolved. 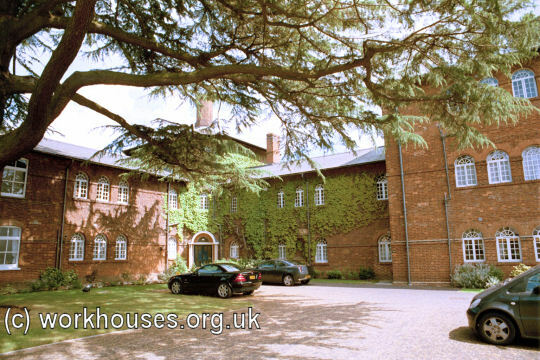 In 1942, the workhouse became St George's Hospital. 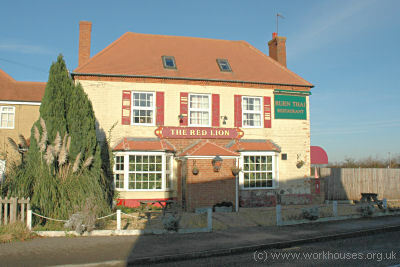 It later became The Cedars Old People's Home run by the Bedfordshire County Council. It has now been converted into private residential accommodation. Bedfordshire and Luton Archives and Records Service, Borough Hall, Cauldwell Street, Bedford. MK42 9AP. A wide variety of records survive including: Guardians' minute books and ledgers (1835-1930 with gaps); birth registers (1847-1936); death registers (1906-10, 1914-51); punishment books (1853-1929); Outdoor relief lists (1844-1930 with gaps); Vaccination registers (1873-1921); etc.